Patrick Joseph "P. J." 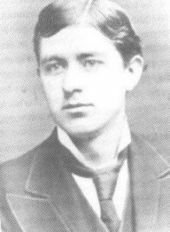 Kennedy (January 14, 1858 – May 18, 1929) was an American businessman and politician. Kennedy was a major figure in the Democratic Party in Boston. He was the father of Joseph P. Kennedy Sr. and the paternal grandfather of President John F. Kennedy. He was the only surviving male in the family after two outbreaks of cholera killed his father and brother. He started work at fourteen as a stevedore in the docks. Kennedy owned three saloons and a whisky import house, and eventually had major interests in coal and banking. He moved successfully into politics, as a sociable man able to mix comfortably with both the Catholic and the Protestant elite, and he sat in the Massachusetts House of Representatives and in the Massachusetts Senate. His particular talent was for the behind-the-scenes machinations for which Boston politics became so notorious. Kennedy was the youngest of five children born to Irish Catholic immigrants Patrick Kennedy (1823–1858) and Bridget Murphy (1824–1888), who were both from New Ross, County Wexford, and married in Boston on September 26, 1849. The couple's elder son, John, had died of cholera in infancy two years before Kennedy was born. Ten months after Kennedy's birth, his father Patrick also succumbed to the infectious cholera epidemic that infested the family's East Boston neighborhood. As the only surviving male, Kennedy was the first family member to receive a formal education. His mother Bridget had purchased an East Boston stationery and notions store where she had worked. The business took off and expanded into a grocery and liquor store. At the age of fourteen, Kennedy left school to work with his mother and three older sisters, Mary, Joanna, and Margaret, as a stevedore on the Boston Docks. In the 1880s, with money he had saved from his modest earnings, he launched a business career by buying a saloon in Haymarket Square downtown. In time, he bought a second establishment by the East Boston docks. Next, to capitalize on the social drinking of upper-class Boston, Kennedy purchased a third bar in an upscale East Boston hotel, the Maverick House. Before he was thirty, his growing prosperity allowed him to buy a whiskey-importing business. On November 23, 1887, Kennedy married Mary Augusta Hickey (December 6, 1857 – May 6, 1923),  daughter of James Hickey and Margaret Martha Field. The couple had four children and remained married until Hickey’s death in May 1923. Ted Kennedy, youngest son of Joseph, named his younger son Patrick (born 1967) to honor P. J. Kennedy. In 1914, P.J. Kennedy's son Joseph married Rose Fitzgerald (1890–1995), the eldest daughter of Boston Mayor John F. Fitzgerald (1863–1950). Joe and Rose had nine children, including World War II casualty Joseph P. Kennedy Jr. (1915–1944), President John F. Kennedy (1917–1963), Senator Robert F. Kennedy (1925–1968), and longtime Senator Ted Kennedy (1932–2009). The Patrick J. Kennedy School, named for him, is a public grammar school located in East Boston. ^ a b Dallek, Robert (2003). "Beginnings". An unfinished life: John F. Kennedy, 1917-1963. Little, Brown, and Co. ISBN 978-0-316-17238-7. Archived from the original on 2006-11-14. ^ "Mary Augusta Hickey". Find A Grave. Retrieved April 16, 2014. ^ "Michael Hickey". Home To Clare. Retrieved October 2, 2016. ^ Kennedy, Joseph Patrick (2001). Smith, Amanda (ed.). Hostage to Fortune: The Letters of Joseph P. Kennedy. Viking. p. 82. ISBN 0-670-86969-4. ^ Kearns Goodwin, Doris (1991). The Fitzgeralds and the Kennedys. Macmillan. p. 412. ISBN 0-312-06354-7. ^ Rachlin, Harvey (1986). The Kennedys: A Chronological History, 1823 to Present. World Almanac. p. 24. ISBN 0-345-33729-8.
" We choose to go to the Moon"
" A rising tide lifts all boats"
" Happy Birthday, Mr. President"